The biggest new of last week would be Reliance introducing its JioPhone. Available starting 24th August, the JioPhone would be available for effective price of Rs. 0. JioPhone has NFC, Voice Command support, VoLTE, Jio Apps, 22 Indian language support and much more. Read more here. 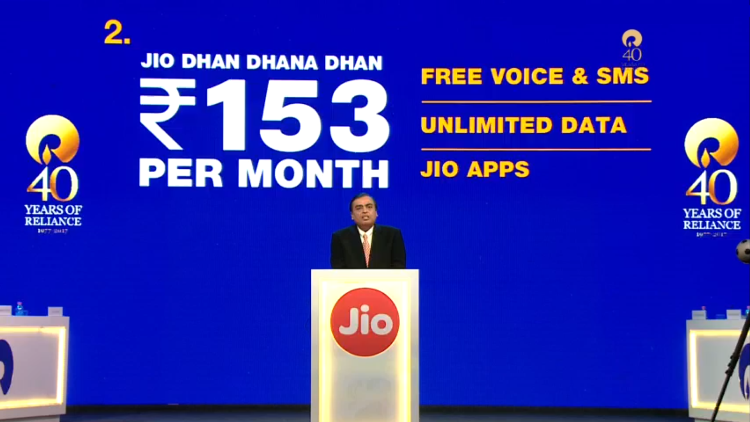 Just like JioPhone, Reliance launched Jio 153 Plan exclusively for Reliance JioPhone users. For Rs. 153, JioPhone users can enjoy Unlimited Local, STD & Roaming calls with 500 MB data per day. Read more here. Reliance has also launched a Jio TV Cable which can be connected to your colour television set on one end and JioPhone on other end and run Jio Apps like Jio TV and more on your TV set. You can read more here. Idea has launched Unlimited Packs for 84 days now. Available for Vivo, Moto E4 & Moto E4 Plus customers, Idea customers can enjoy Unlimited Calling & Data for 84 days. You can read more here. BSNL launched Pratibha Plan for AP & Telengana telecom circle. Available only for Students, BSNL Pratibha Plan allows Unlimited Calling to 1 BSNL Local number for 180 days. Read more here. BSNL revised its Triple Ace 333, Nehle Pe Dehla 395, Dil Bol ke Khol 349 Plan staring 23rd July, 2017. Once again BSNL reduced the validity of its famous Plans. You can read more here. BSNL introduced 2 Mbps Unlimited Broadband Plan for Rs. 599 only. Available for customers in all circles, BSNL 599 Unlimited Broadband Plan also offers Unlimited Calling to any network during night hours and on Sundays along with 2 Mbps data without any Fair Usage Policy. Read more here. Vivo smartphone users can also enjoy Extra Data from Reliance Jio. Reliance Jio is offering up to 60 GB Extra data to Vivo smartphone owners. Micromax, Celkon, Asus & Xiaomi users already can enjoy Extra Data on their Reliance Jio SIM. You can read more here. Telenor has introduced new 4G Plans in Gujarat telecom circle. Telenor 4G was available in Anand till now and it is now available in Ahmedabad, Surat, Bhavnagar & Baroda also. Read more here. If you are looking to take up BSNL Broadband connection, it is the best time to do so. BSNL is offering 100% cash back on Modem cost (Rs. 1500), waiver of Installation charges and 1 month rental waiver if booked online. Read more here. Lastly, BSNL launched a Postpaid Dev Bhoomi Plan for Rs. 475 offering 1GB data per day and more. But the Plan is exclusive to BSNL Himachal Pradesh telecom circle only. Read more here.